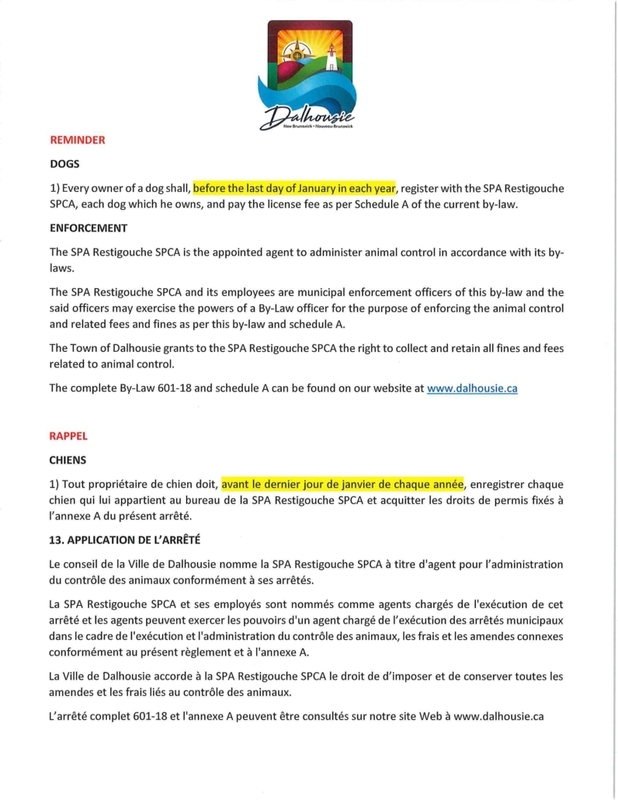 1) Every owner of a dog shall, before the last day of January in each year, register with the SPA Restigouche SPCA, each dog which he owns, and pay the license fee as per Schedule A of the current by-law. The SPA Restigouche SPCA is the appointed agent to administer animal control in accordance with its by-laws. The SPA Restigouche SPCA and its employees are municipal enforcement officers of this by-law and the said officers may exercise the powers of a By-Law officer for the purpose of enforcing the animal control and related fees and fines as per this by-law and schedule A. The Town of Dalhousie grants to the SPA Restigouche SPCA the right to collect and retain all fines and fees related to animal control.